To remove any type of service from the listings below, click a service icon above to disable it, and then Refresh List. For example, click above and then Refresh List to exclude restaurants from the list below. Too much information? You can exclude types of businesses/services from the listings above, by clicking the round service icon(s) at the top of the page and then Refresh List. For example, click near the top of the page, and then Refresh List to exclude restaurants from this list. McKittrick was the first overnight on my end-to-end trail ride and I arrived at the end of an afternoon thunderstorm. Joey's Birdhouse was a welcome sight and certainly lived up to all the positive reviews from other travelers. It was a relief to have a place to relax and get cleaned up after a warm day followed by a serious rain. Joey was a perfect host and even carted me over to Hermann for a late supper. I think the hospitality provided by the B&B owners and other businesses along the way is what makes this trail such a great experience, especially given that riders arrive hot, tired, dirty and wet. 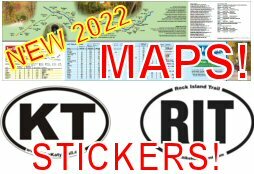 Are the towns of McKittrick, Rhineland, Bluffton, doing anything to prepare for the Solar Eclipse on Aug 21st? These towns will be in a good viewing path. They may see more bikers coming into their area; I was just wondering if there will be sufficient restrooms and parking areas. We rode most of the Katy over Memorial Day week and stayed at Joey's Birdhouse on May 30th. We chose Joey's because of all of the positive comments left here. I must say that they were all accurate. Joey was wonderful. It was like staying with family. We will definitely book with her anytime we are in the area again. I highly recommend that you give her a try if you are in the area looking for a place to stay. Thank you so much for choosing my place. The best thing about being a B&B hostess on Katy Trail is the very nice and interesting people I meet every day. It's great. Hi Joey! We stayed with you a couple years ago and it was one of the highlights of our trek! You are a Katy Trail Superstar and get nothing but rave reviews on this site for your hospitality and FANTASTIC cooking. We even got lucky with a guided truck tour of Hermann and McKittrick thanks to Rich. We too stayed with Joey one night in early June and were very glad we did. Our accommodations were so cozy and cool, well-insulated against noise, and full of little touches that were so welcome, such as snacks, and nice smelling soaps, books, etc. The breakfast was absolutely amazing with fresh eggs, greens and sweet potatoes from the garden and homemade elderberry jam on biscuits right out of the oven and fresh herbs, etc. etc. Hermann was not far away and was fun to visit. A very affordable stay, right on the Katy! I would highly recommend a stay at Joey's Birdhouse! 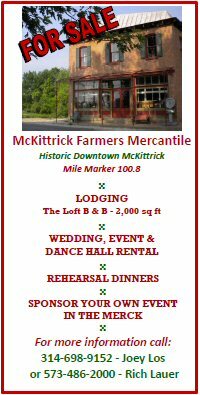 11/4 We ride from Rocheport to McKittrick and stayed at the Mercantile building managed by Joey who also runs the Bird House B&B in Mckittrick. The room is the entire upper floor of an old store building. It could easily accommodate 50 people, but sorry only one bathroom upstairs. Joey was supper accomodating. She took my son and I over to Herman, where we had dinner at the Tim Mill resturant on Main St. Then she came back and picked us up, and brought us back over the B&B after dinner. Saturday morning she made us a wonderful breakfast of egg quiche, home made fruit salid, and home made biscuits and jelly. That gave us plenty of fuel to ride the rest of the way back to St. Charles. We stayed at Joey's B&B in McKittrick on Oct. 12, 2016. It was fantastic. We appreciated the snacks on our arrival, the shuttle to dinner in Hermann, and the use of laundry facilities. This place was very close to the trail, Joey was a great host, and we had the best breakfast of the week here. Thank you for the nice review. It has been great to cook for the guests lots of fruits and vegetables from the garden. A happy busy season making lots of new friends. Hope to see you all again. Joey's place has very clean, clean smelling, well air conditioned, spacious rooms. Each room has its own bathroom. We had dinner when we arrived; very good at 20/person, with wine included. the frig was stocked with a couple beers, OJ and milk. there were snacks and water. breakfast was great. Joey and her helpers were really nice, accomodating and entertaining. This is a full size grocery store and only about 1/4 mile from the trail. An exit off the trail on the west side of the underpass is in process of being completed. When we were there the ramp exit was dirt and usable. From this store getting into Herman is pretty easy and only about 1.5 miles. The road has a wide shoulder that continues across the new bridge into Herman. I stopped by the Loutre Market to pick up dinner on my way to camping at Hermann City Park, and I was pleasantly surprised -- the market was a full-sized grocery store and was clean & well-stocked. The deli had a big variety of both hot & cold foods. They had some pre-made hoagie sandwiches, but the counter gal told me they could make a hoagie from any of the lunch meats & cheeses they had in their display case. I got a pre-made ham & cheese and some macaroni salad, along with some snacks from the grocery aisles. Everything was delicious & fresh. Friendly help there, too. Highly recommended. Ate there last Thursday. Food was good, service was better...let me sub in veggies for fried stuff on daily special. Picked up groceries for rest of day. Worth the stop. Go south on the Hermann spur trail just to west of bridge. $1 Gatorade the day I was there!! Awesome! Thanks for the update. McKittrick = Joey's Birdhouse!!!! Favorite stop on the Katy! We stayed with Joey, very nice place, great breakfasts. Rode into Herman for supper. Real neat town. My son and I rode the trail from west to east and Joey's Birdhouse was one of the highlights of our trip. The accommodations were wonderful. The best way to sum it up is a home away from home. Joey was a wonderful host. Any thing that we needed was provided without any questions. She even helped me find a unique gift for my wife that was delivered to us before we left. The breakfast that we were served was phenomenal. I would definitely recommend that you make this a MUST STOP along the trail. We stayed at Meyer's Hilltop B & B with Maggie and her husband. We had a superb room just off the Katy Trail that was so beautiful, laid back, and relaxing! Maggie made the most scrumptious breakfast the next morning, and gave us directions to many places to check out in Hermann across the river. We had such a wonderful stay and hope to return next time we are on the Katy Trail again! We highly recommend this place to stay to all! I highly recommend Joey’s Birdhouse as an overnight stay in McKittrick. This past week was our first experience on the KATY trail and Joey’s was a definite highlight for us. The room was convenient, clean, and comfortable. Joey is an energetic and creative woman who freely shared her garden, her knowledge, her conversation, and her enthusiasm for McKittrick and the trail with us. She and Rich provided a regular haven for two tired cyclists. We will definitely make Joey’s Birdhouse a planned stop the next time we travel the KATY. Don't cut yourself short. 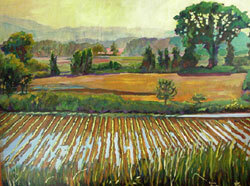 There is alot to experience in Hermann a very short distance away. There hundreds of beds in Hermann. High to low in cost and service. Which brings about another quandary: What is an anonymous and does anyone really lend credibility to an entity that is so negative. I don't know Rich. Maybe it was just someone with a financial interest in getting riders across the river. To give them credit, they were positively being jerks about it. I live in Hermann, shop in Hermann,ran for mayor in Hermann last year and again in 2014. 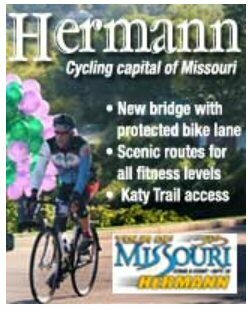 I an trying to build the first cycleport in Hermann,so I have interest in Hermann. I also have common sense enough to know that there are many types of riders with a variety of interests. I have steered borders to Hermann if they want to tour the city and winerys. If they are doing the larger part of the trail I assist them on staying the trail and on task. Healthy food water and skip the heavy drinking. I am allowed to do this. I think there is an ordinance here stating this. I will ask Mayor Joey for confirmation. Rich, looks to me that Doug was supporting you. This forum is about the trail. Hermann is Hermann...not the trail...just sayin'..keep the rubber side down. My point Rich, was that anon and others have a right to talk well of Hermann and try to bring business there but not by stepping on well deserved comments about You and Joey or other businesses on this side of the river. That's when they become Jerks. Rich, I hope you can get DNR to put in a campground. I talked to them about doing the same thing on land that they already own adjacent to the JC trailhead but the response was that the trail closes from dusk to dawn so any campsite would technically illegal. Hopefully, since the site you're talking about is outside of the trail boundary, you might have better luck. I think it could be said we all love the trail and appreciate the company that comes down it. Joey's Birdhouse is a definite repeat for our future trail rides. Clean, comfortable private room/bath with WiFi, hand-written notes welcoming us, cookies on table and cold drinks in the fridge to boot. Owners of this B&B are a wonderful couple who epitomize what the Katy Trail is all about. Joey's Birdhouse with Hermann just 2 miles across the river makes McKittrick a must-stop. I wrote it in another post but Loutre Market in fact is very easy to get to from McKittrick trailhead. On west side of tunnel under Highway 19 is short spur trail, from there just pedal across highway to Loutre. 3 minute pedal at most. Of course if Mercantile is open then just go there. Just on the east side of the Katy/Highway 19 overpass, there is a short path up to the highway....then a nice coast down the hill to Loutre's Market. Much simpler than finding the gravel road east of the trailhead and riding the gravel. Trek are you overheated? WEST side of the overpass for the spur trail. I know you know which side it's on! Yes, Loutre Market is VERY EASY to get to from McKittrick, in fact you can easily see the building from the trailhead. I agree the trail is not marked well enough though. Loutre Market is great, I went in there once with no money and thirsty from the trail and they let me have a bottled water. Of course I repaid them later. Good ol country market.